This is a "Petite" Mini-Snap that coordinates with 12mm jewelry bases. 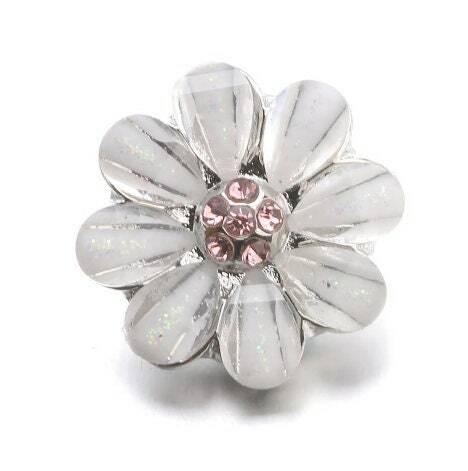 This piece is a light pink/white "aurora borealis" flower with a light pink crystal center. 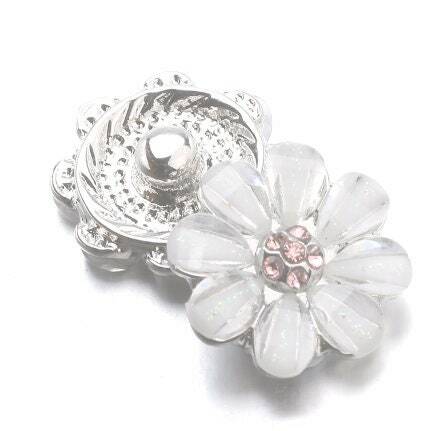 These flower snaps are very light-weight and petite. They coordinate with 12mm petite snap jewelry. Please note that these pieces do not coordinate with our standard 18mm snap jewelry. We will be adding mini-base pieces in the future to our store. NOTE: These pieces do coordinate with the Petite GingerSnaps line of snap jewelry, as well as the Petite Mini Magnolia and Vine line of Snap jewelry. Not sure if they coordinate with your snap jewelry? Send me a convo and I will let you know!